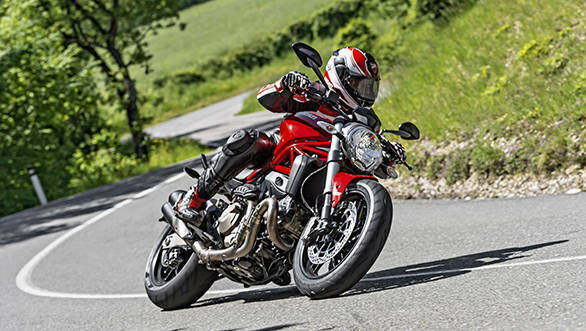 The new generation of the Ducati Monster came out in November 2013 at the Milan Motorcycle Show. It was the 1200 and it featured a raft of new technologies that marked the arrival of a faster, safer, more hi-tech new Monster. 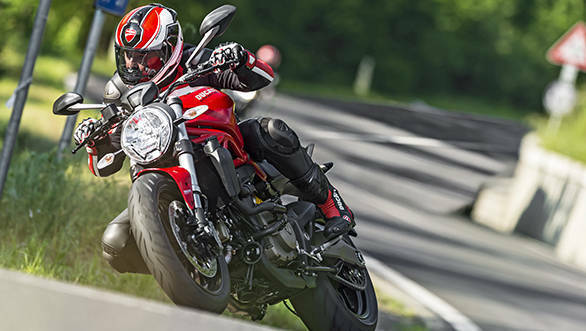 Since then, Ducati have also launched the second of the new Monsters, the 821 line. On sale now for Rs 9-odd lakh ex-Delhi, here is what the Ducati is like. The whole thing is new. The frame is still a trellis but it's new. 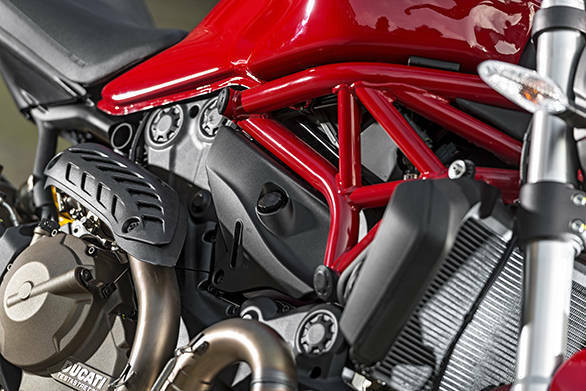 The Testastretta 11° engine has been used on the Hypermotard but it's new to the Monster and the styling has been updated and freshened within the tenets of traditional Ducati Monster design. 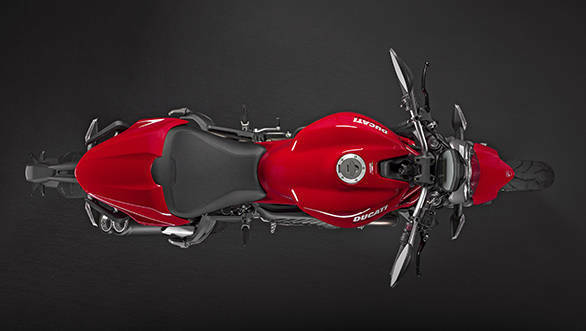 The 1200 debuted much of the framework but the 821 is effectively all-new. Yes. The 821cc Testastretta 11° engine is new. As we said, Ducati have used this on the Hypermotard and this is the second generation of the Testastretta named engines. The numeric refers to the valve overlap. As Ducati themselves point out, their sportsbike uses 41 degrees of valve overlap. Crank rotation is measured in degrees - 360 degrees is a full rotation. 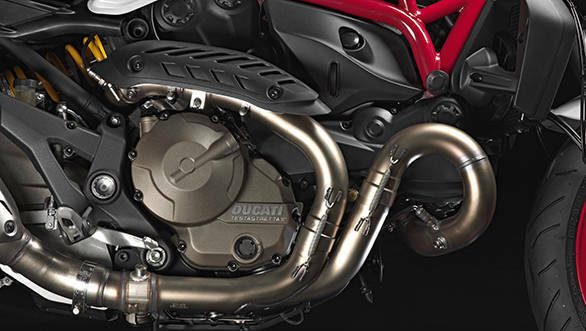 What valve overlap means is that for that many degrees - 41 on the Panigale - both intake and exhaust valves are open. This sounds silly and wasteful but high revving engines don't have much time to fill and vacate the combustion chamber. The valve overlap allows the vacuum of the exiting exhaust gases to pull in fresh charge. The point is that large valve overlaps are used to ensure that high revving engines, where the performance at the top of the rev band is critical, can breathe in and out fully. The dramatically shorter 11° overlap indicates an engine that takes its bottom-end and mid-range performance a lot more seriously than near-redline work. 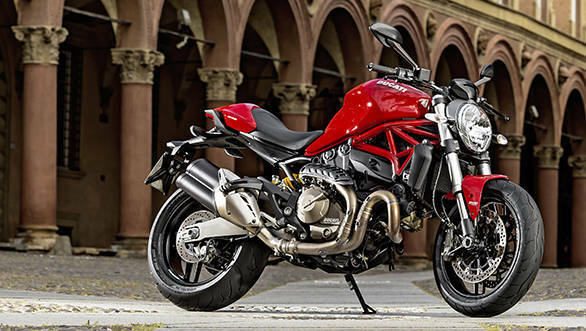 Yes that's the nature of the Hypermotard as well as now, the Ducati Monster 821. The motor still uses Ducati's trademark Desmodromic (a mechanism where the valves are positively opened and closed by lever arms rather than springs) valves. It produces a peak output of 112PS at 9,250rpm. More important for the 821 is the torque which peaks at 89.4Nm at 7,750rpm. There are numerous other things in the engine but the new slipper clutch is standard and it's an interesting mechanism. 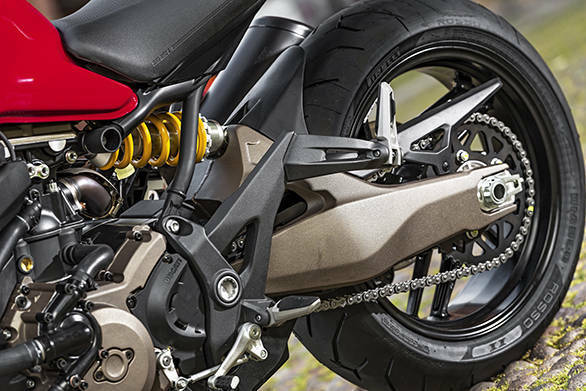 It uses a self-servo to press the friction plates together under power to enhance efficiency while allowing Ducati to use lighter springs that cut lever effort. The same mechanism loosens the friction plates and work as a slipper clutch when the drive forces are reversed as you downshift on a closed throttle. Finally, the Testastretta 11° engine has major services 30,000km apart by design which should make the 821 easier and more affordable to live with. Shell supplies its Advance PurePlus for the Monster and that allows the bike 15,000km oil change intervals. The frame is of course a steel trellis. But the 821 uses mounting points on the engine head just like the Panigale. In that sense, the engine is very much a stressed member of the chassis. The 821 also uses a shorter new cast aluminium double-sided swingarm design. The new setup is interesting to look at because there's a short trellis (over 1kg lighter than earlier) that starts at the headstock and ends at the engine. The matte black engine is the continuation of the frame. The end of the vertical cylinder has the black trellis subframe (also over a kilogram lighter than before) bolted to it. Also bolted here is the monoshock's top mount while the bottom is directly mounted to the top of the swingarm. Ducati have worked on the setup of the motorcycle in terms of its intended use. Hence the wheelbase is 30mm longer to create a more spacious platform while the bars are moved back and higher by 40mm each. This should mean a less leaned forward, more comfy riding position. As usual, Ducati have a range of height adjustments built into the seat and this range is further augmented by purchaseable lower and higher seats as well. Point to note is that the stock seat's lowest height is 5mm lower than the 795 and the 821 will replace both the 796 and 795 Monsters. Ducati also say that the seat is wider and longer to give both the rider and the pillion more space. What else is like the Panigale then? The rear Sachs shock - with preload and rebound adjustment - mounts directly to the rear cylinder which is again, similar to the superbike. Up front, a 43mm Kayaba does duty. 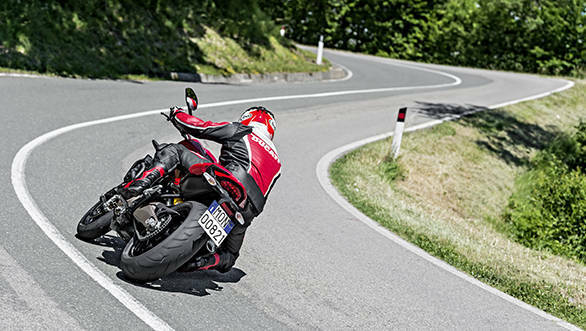 Also Panigale-like are the 10-spoke alloy wheels that wear 120- and 180-section Pirelli Diablo Rosso Corsa II dual compound tyres. It sounds like a complicated motorcycle. Isn't the Monster supposed to be a simple pleasure? As time progresses, things change. The nature of simplicity in motorcycling itself has changed. The days when motorcycles were two wheels and an engine tied together by a chassis are gone. Today's bikes need much more. So the Monster 821 sounds like a lot is going on but most of this is under its skin rather than in your face. For example, the big LCD display can look complex but after a while you come to appreciate its clarity. When you start it up, the Monster 821 is very familiar. That V-twin sounds the same as I remember it - vocal, throaty and there's a lovey brraap from the new engine. I like it. We got the bikes in Touring mode where full power is available but the computer gives you a little less power than you demand, to make the throttle response feel more smooth. This works nicely but I have to say that I cycled through the modes and found myself liking Sport the most. I like its directness but I can already see that new riders and long distance riders would probably be far better served by the other modes. The gearbox is precise but I found a bunch of false neutrals that I suspect are a lever position problem, not a design issue - I shall get the lever adjusted and then update this story. Ride quality is stiff as you expect from Ducatis but the level of absorption is quite good and I wouldn't complain about the stiffness in our conditions. The handling of the Monster has always been a highlight and the 821 does not disappoint. There's that immediacy that I was looking for and it's very nice to ride. In fact, while Ducati have stuffed the bike full of electronics, they've successfully managed to keep the essential simplicity of the experience. In fact, I loved the bike for it when I first rode it and I like this one just as much for it. Ok fine, tell me about the electronics. The 821 has a lot of electronics. 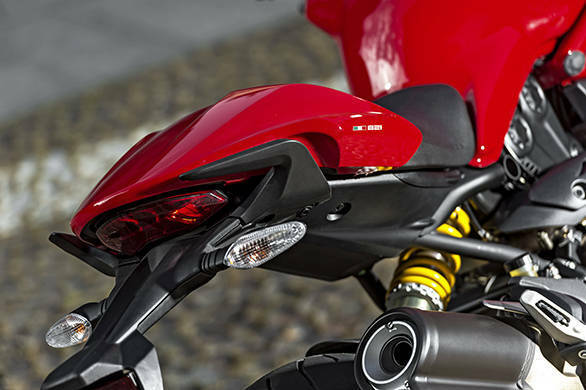 Standard is the excellent Ducati Traction Control with its eight user selectable levels of interference. Also standard is the ABS system which has three levels of rear wheel lift control. Together, Ducati calls this the Safety Pack. Since the 821 has a ride by wire setup, it also has three riding modes. The gentlest is Urban which limits power to 75PS, softens throttle response and puts both ABS and traction control on high alert. Touring and Sport both offer full power but the former is gentler in response and more strict on ABS and traction control interference than Urban. Sport offers the sharpest responses and the least interference. Of course, you can change the ABS setting or turn it off as well as also tailor the traction control setup to your liking within the riding modes. All that for Rs 9-odd lakh? That's great value no? Well, no. The 821 is expensive especially when compared to the Monster 795 and 796. It will go on sale in a month from now in India. 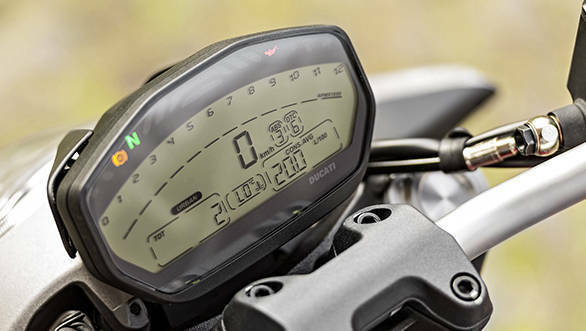 However, the 821 brings to the table a new standard of Monster performance backed up by a very comprehensive setup of electronic safety mechanism. It's a lot more expensive but you do get a lot more for your money too. The Ducati is set to take up the mantle of being Ducati's entry motorcycle for India, most likely at prices not too dissimilar to the Monster 795 and 796. The Ducati 821 is the entry level motorcycle for Ducati's most popular line of motorcycles, the Monster. Ducati say they're a premium brand and therefore the pricing reflects that and promise not only an exceptionally easy Monster to ride but also the world class after sales experience that Indian Ducatisti haven't seen yet.